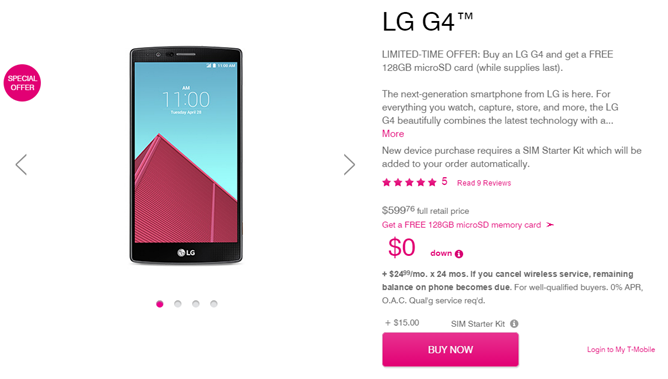 In the race to sell LG's latest flagship Android phone to Americans, T-Mobile wins by a nose. As promised, the carrier is now selling its own version of the G4 to customers. You can buy it outright on T-Mo's contract-free setup for $599.76, or split your payments into 24 monthly chunks of $24.99. T-Mobile is also giving away a free 128GB MicroSD card with new purchases while supplies last - according to Amazon, that's about an $80 value. The G4 is a worthy adversary to flagships like the HTC One M9 and Samsung's pair of Galaxy S6 siblings. In his exhaustive review, David Ruddock praised the phone's excellent battery life, solid display, and competitive camera. In addition to top-of-the-line specs it offers a replaceable battery and a MicroSD card slot, a major plus for Android enthusiasts who prefer flexibility over style and thinness. It's also a bit cheaper than the competition: the M9 costs $650 for the 32GB T-Mobile model, while the 32GB Galaxy S6 and S6 Edge are $680 and $730, respectively. Ouch. According to T-Mobile the carrier has an American exclusive on the brown leather rear cover, which costs the same as the version with the grey plastic diamond-pattern rear. 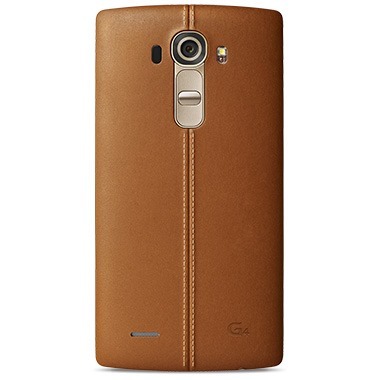 The G4 will be coming to US Cellular on Friday, May 29th, followed by Sprint on June 5th. Verizon and AT&T have confirmed that they will carry the phone, though they haven't pinned down dates as of yet.